The delicate moon of Sha'baan 1433. A simple sliver of light in the twilight sky that grabbed the attention and would not let go. 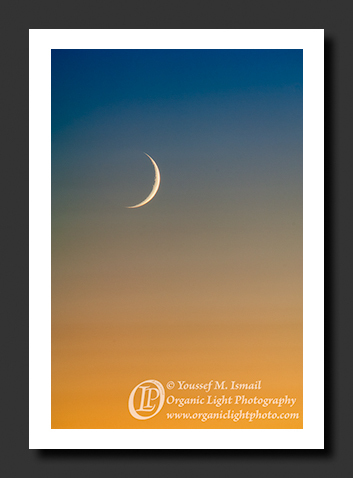 Each month this moon appears in the twilight sky marking the beginning of another cycle. Over 1400 years ago, as the Mercy to all of Creation was fleeing religious persecution from his birth place to his eventual resting place, he, peace be upon him, looked up in the sky and saw such a crescent moon and supplicated "Oh God, bring us into this month with this moon, in safety and faith, and in peace and submission to you". Then as he pointed to himself and then to the moon addressing it and said" "My Lord and your Lord is Allah (God)". From that day on Muslims have marked their months with the moon. It is a sacred tradition that if practiced will connect one's soul with the Creator through witnessing the act of the Creator bringing the moon in to the realm of existence from non-existence right before our very eyes. Its also a tradition that is facing what could be its throes of death. Unfortunately, this tradition is being traded in for lifeless, heartless, cold and calculated science to mark the days rather than experiencing it with one's being for the sake of expediency. Keeping this tradition alive is like keeping the Prophet, peace be upon him, himself alive in your heart. His companions were willing to sacrifice their own lives in battle acting as shields to preserve his life. Do not rob yourselves of the great distinction of keeping the Prophet, peace be upon him, alive in your own hearts and actions.